Thanks for visiting our website. We hope you will join us sometime at Gale. Here is what you can expect when you join us for a Sunday morning service. We have a large welcoming narthex where members often chat before the service. There are greeters at the doors to the sanctuary to welcome you. Gale is fully accessible with a drive-up entrance and drop-off area and plenty of parking. With a new building and location we are able to worship together in the bright and open sanctuary and fellowship together in the front lobby before and after service. There is also coffee hour held after services in the gym. The Sunday service starts at 10:30 am. Ushers can help you find your seat in the comfortable cushioned seats. There are designated locations for wheelchairs. Occasionally we hold Cafe Church in the fellowship hall for a more casual and participatory service. And it includes coffee, tea and muffins! At the beginning of the service there is a Children’s Story where the children are asked to come to the front of the church for a short interactive lesson and then Sunday School runs for the rest of service downstairs. Nursery is also available during the service. 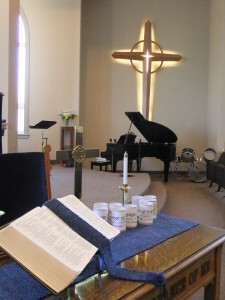 There is a praise band and a choir with projected hymns on a big screen as well as hymn books and Bibles found in the pews if you prefer to read along. Gale encourages all ages to be involved during the service for a morning of worship together as a church family. With young and old sharing the scripture readings and participating in the service, we think you will feel at home here at Gale. There are also lots of other events going on throughout the week. Check out the Calendar for more details on upcoming events. To help get a better understanding of what a Sunday service is like at Gale we have laid out the order of service below. We hope you are able to join us! Need to find us? Join us in our new location 10 Barnswallow Drive at the corner of Barnswallow Drive and Church Street West (Highway 86) on the northwest corner of Elmira, ON., Canada.